The one of a kind Adventure Tower is a Challenge Course on two levels. A high chance of fun and getting dirty on the ATV courses! Have a blast on the ATV technical course! The Adventure Tower is perfect for the thrill seeker in you! 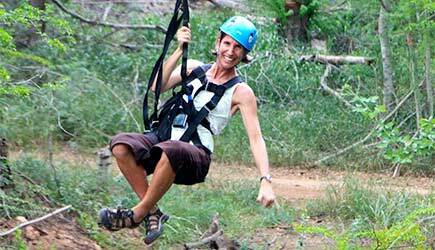 Experience adventures for the whole family at Coral Crater Adventure Park zipline! These thrilling activities includes a 25 mile per hour zipline, off-road side-by-side ATV, and a king swing. Connect with family and friends as you laugh and play together. At Coral Crater Adventure park their tours are designed for fun and exciting challenges to bring you outdoors and get your blood pumping! The signature zipline course features six lines ranging from 300 to 900 feet. It is also equipped with the most modern braking system, which means you do not need to control their speed or stop yourself. This allows for all ages (within weight restrictions) and abilities to participate. There’s a variety of tours to choose from, and they do not require any previous experience of skills. Their professional and friendly guides will help you every step of the way, from providing safety equipment and leading you through courses. 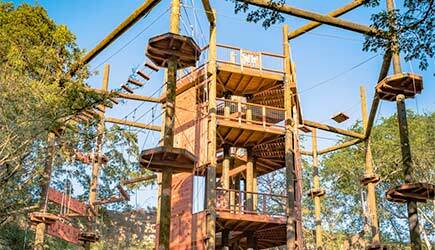 The 60 foot Adventure Tower is a Challenge Course on two levels, 20-40 feet up in the air, and it is the only on of its kind in Hawaii. You will be outfitted with a full body harness and state of the art Clic-it system. This synchronizes the open/locked positions of the two carabiners that require to always be connected to the line. The tower has 18 challenge elements, and you’ll navigate through the ropes, walk across wobbly bridges and surf on a rail. The King Swing is a massive pendulum swing that will get your heart racing, and their guides slowly lower you to the ground after. Experience the sensation of a freefall as you step off the top of the Adventure tower! The magnetic braking technology slowly lowers you the rest of the way to the ground. Don’t forget to give their Climbing Wall a try with their 4 unique routes! On the ATV tours, there is a technical course as well as smoother runs to be enjoyed. Their skilled guides will teach you basic off-road techniques and you’ll have a blast navigating the technical course. If you want to do it all, then the Ultimate Adventure is for you! You can choose any order you desire from all six ziplines, off-road in a side-by-side ATV, the king swing, freefall, and the state-of-the art Adventure Tower. This tour will satisfy you thirst for adventure and you will spend the day participating in exciting new experiences. From start to finish, their guides will accompany you throughout the day. Transportation: Round-trip transportation with pickup at Waikiki and Ko Olina area hotels is included. Combine the Adventure Tower with a full zip tour! You will enjoy all 6 lines as you zip through trees, race on tandem lines, and step off a 20 foot platform using an auto-belay system. Schedule: Daily at 10am and 12:30pm. Transportation: Round-trip transportation with pickup at Waikiki and Ko Olina included area hotels is included for the 10am tour only. Do you want an extreme air and land adventure? This tour gives you all six runs of the signature zipline course combined with an ATV adventure. After the thrill of soaring through the air, cruise around on their all-terrain vehicles. Schedule: Daily at 9am, 10am, 1pm, and 2pm. Transportation: Round-trip transportation with pickup at Waikiki and Ko Olina area hotels is included for the 10am tour only. Reserve Zipline & Off Road Adv. This is the signature Coral Crater Zipline tour, and the guides lead you through six thrilling ziplines! This perfect experience for anyone wanting a safe, adrenaline pumping, and high flying adventure. Transportation: Round-trip transportation with pickup at Waikiki and Ko Olina area hotels is available for $30 per person for the 10am tour only. Check in: 15 minutes before start of tour. What to Bring & Wear: Dress comfortably and closed-toe shoes are required. It is an outdoor facility so dress for the weather, and they operate rain or shine. You will most likely get dirty on an ATV tour, so bring a change of clothes. They have vendors that sell food and beverages that you can enjoy at a picnic area. No outside food and beverages are allowed. BBQ rental is also available for a small fee, and grillable food is available for purchase. They supply the BBQ, propane, tongs and spatulas. Included in Tour: Essential rental gear (helmets, harnesses, etc.) for each activity. Restrictions: Minimum age is 6 years old. Minimum weight to zipline solo is 60 lbs (children 40-60 lbs. can zip tandem with guide) and maximum weight is 275 pounds. Minimum height is 4 foot 6 inches, and shorter participants require adult assistance. Adult participants can assist a maximum of two guests under 4 foot 6 inches. You must be 18 or older to drive the ATV. Participants under 18 can be a passenger on an ATV. Pregnant women are not allowed to participate in any of the tours, and the tours are not recommended for people with back or neck injuries or for those with difficulty walking. You must be reasonably fit to enjoy our tours, because there is some walking involved between some of the zip lines as well as a stretch which includes a short incline. Some of the walking paths may have loose footing and roots/rocks.You will need to be capable of carrying 15 pounds for the duration of your tour. Coral Crater reserves the right to cancel your tour if they are concerned about your physical well being. Coral Crater Adventure Park Zipline packages may be available for passengers who are in port for the day as long as the cruise ship is scheduled to dock at 8am or earlier.